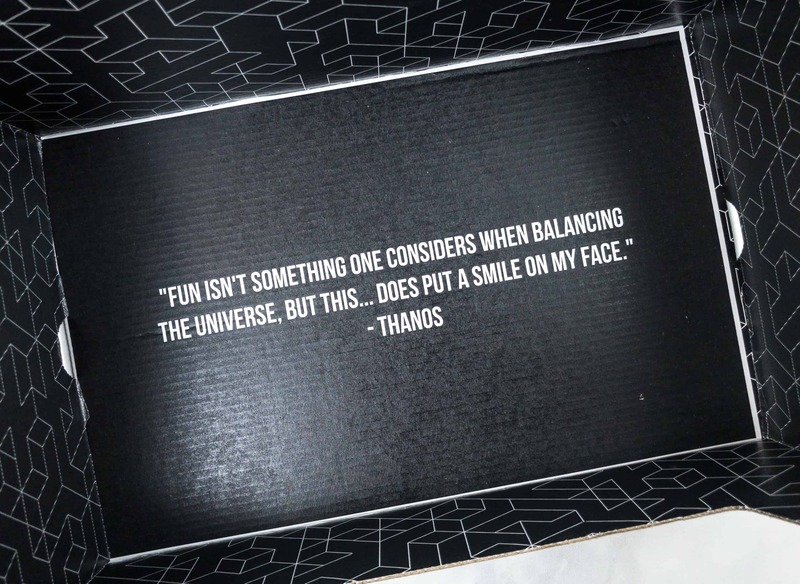 Fun isn’t something one considers when balancing the universe, but this… Does put a smile on my face. 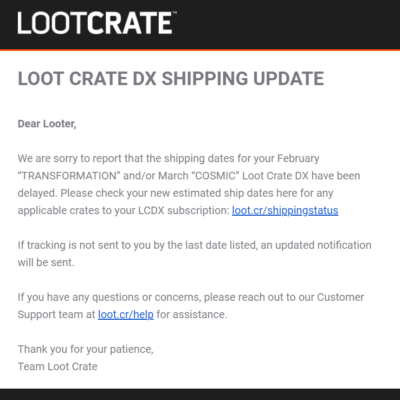 The theme this month is ARTIFACTS DX! 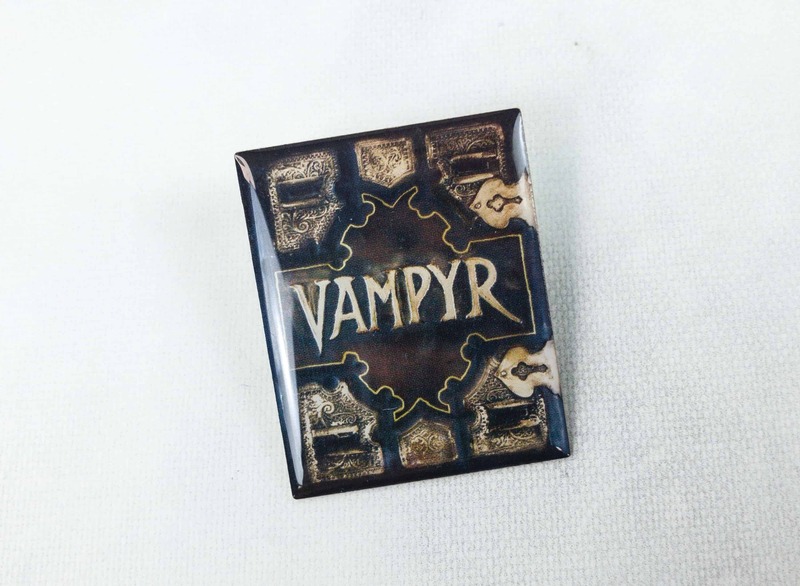 Buffy The Vampire Slayer Vampyr Book Pin. 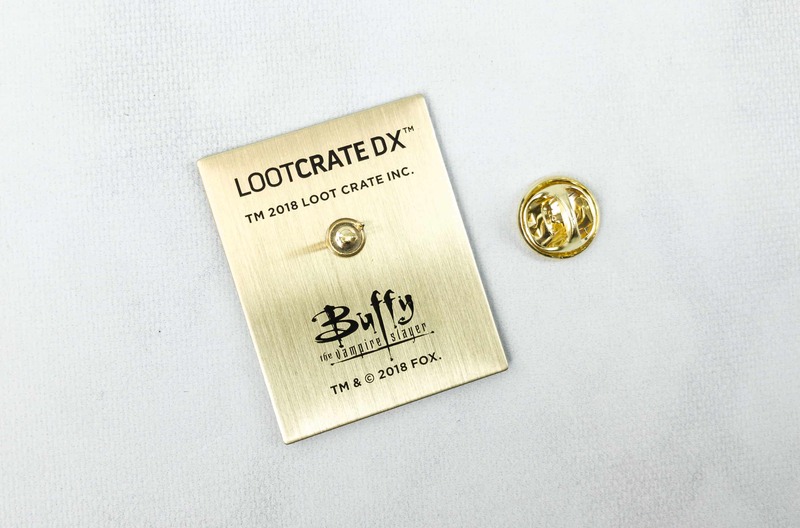 This month’s pin features an item from Buffy, our favorite vampire slayer. The Vampyr, also known as the Slayer Handbook, was a manual given to Slayers by their Watchers. It instructs them on how to operate as the Slayer. The cool pin has a single post at the back. I think it will be enough to support the weight of the whole pin when used. 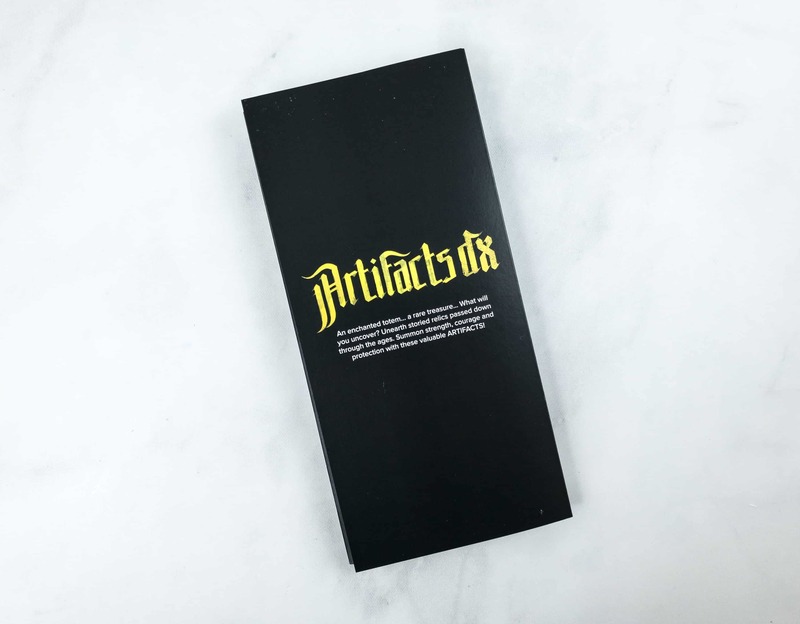 In the series, the book contains history and rules concerning magic and the supernatural world… Hmmm, I think I would love to get my hands on the actual manual! 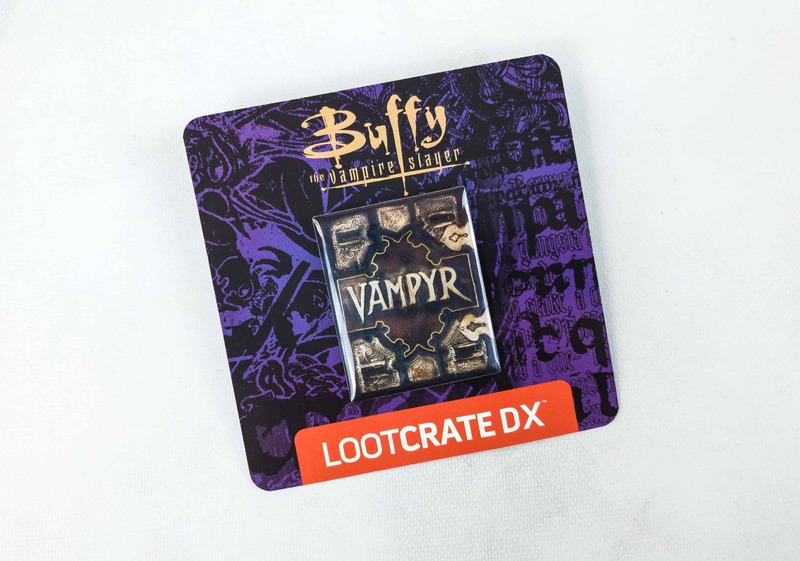 I’m happy that Loot Crate has had a few Buffy items, but I’m going to be honest – it’s not ENOUGH. I want basically a whole box of Buffy. 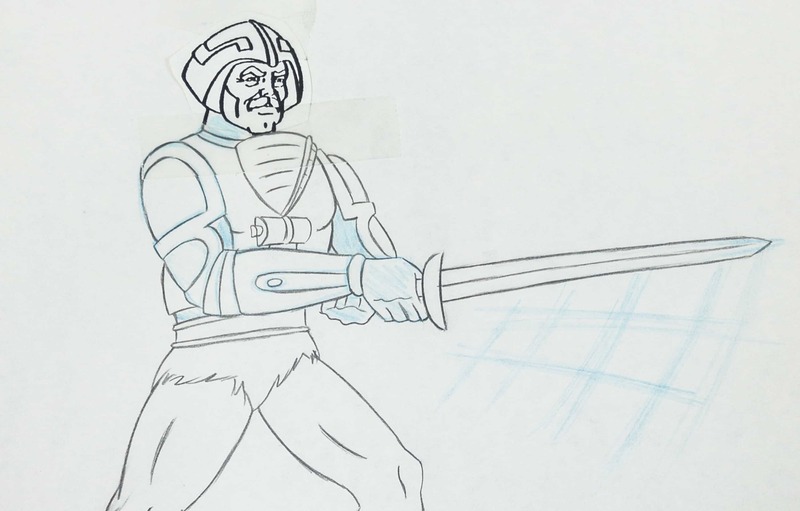 He-Man And The Masters Of The Universe Production Pencil Drawings. This sketch is surely special as it arrived a protective box! 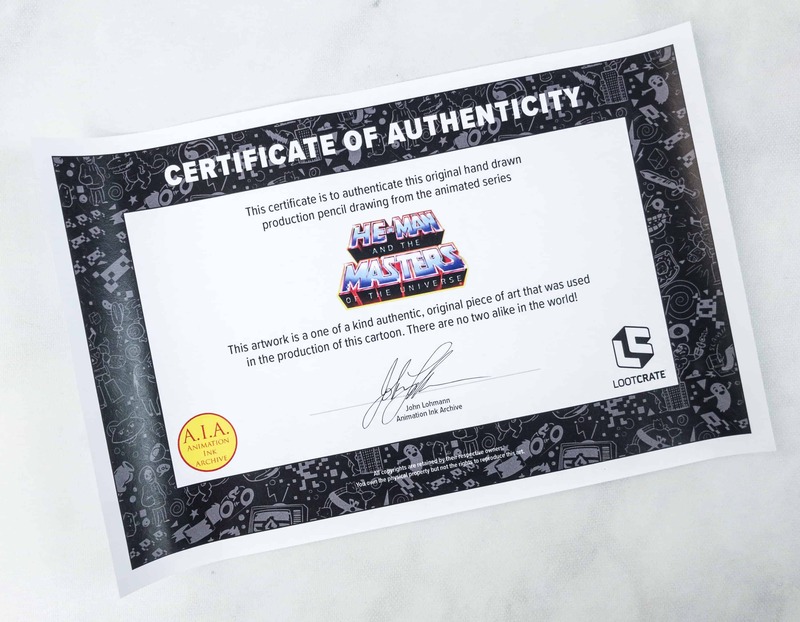 It came with a Certificate of Authenticity to prove that this is a part of the storyboard art used for the animated version of the Masters of the Universe. 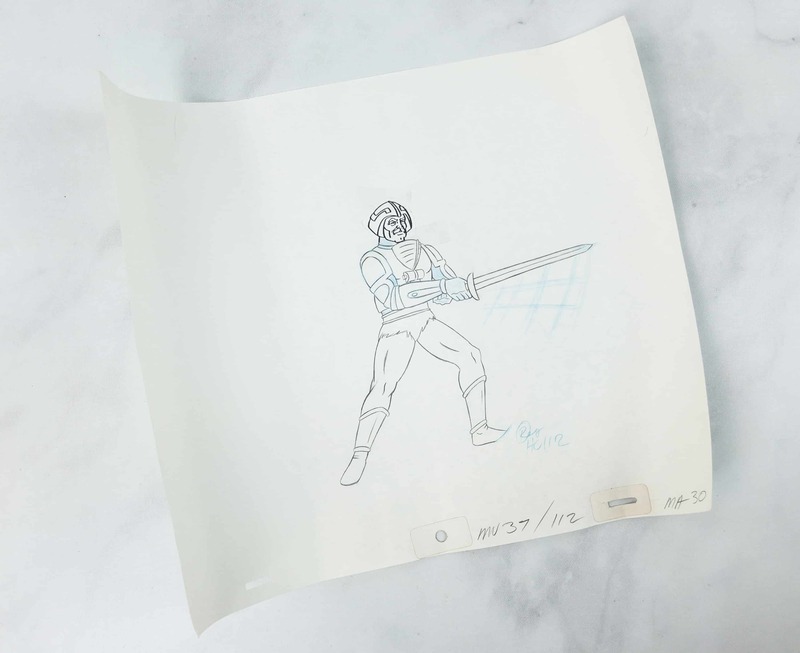 I got the Man at Arms drawing, I think he’s training or fighting somebody in this art… I can’t tell what or which episode this scene was shown! It’s from 1983! The Man at Arms is the adviser of the planet’s ruling monarch and also the leader of the Royal Guard on military and police affair. 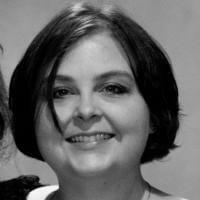 I’m not sure this is really my thing, but my husband was really pleased with it. 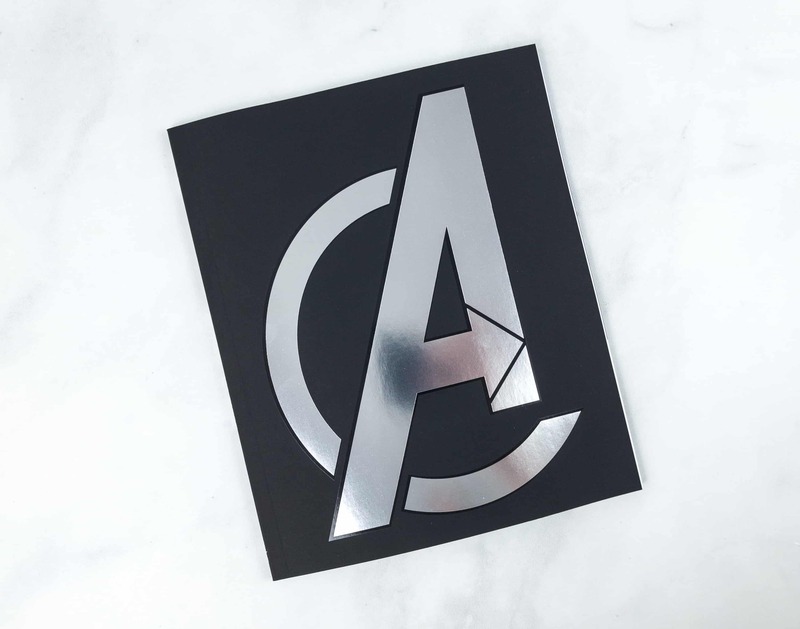 Marvel The Avengers: The Essential Guide Book. Following the hype of the Infinity War, we got the ultimate guide for the MCU’s successful league of superheroes. 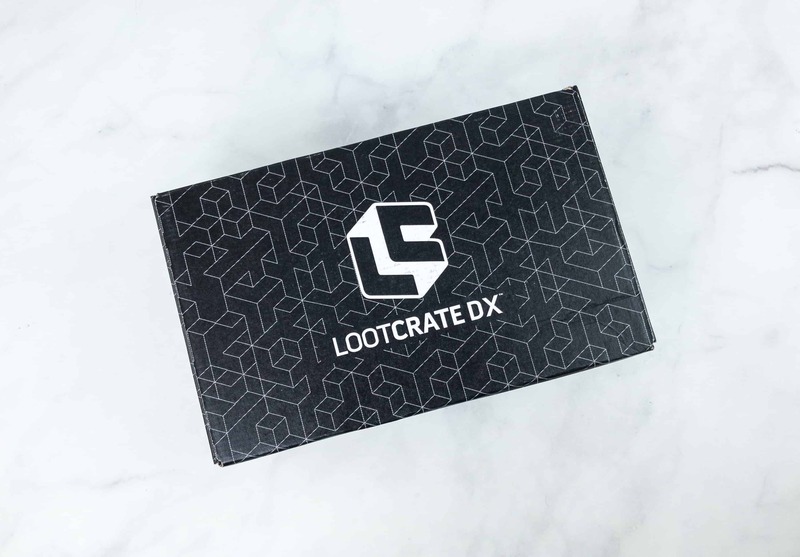 It’s a Loot Crate exclusive version of the guide published by DK. 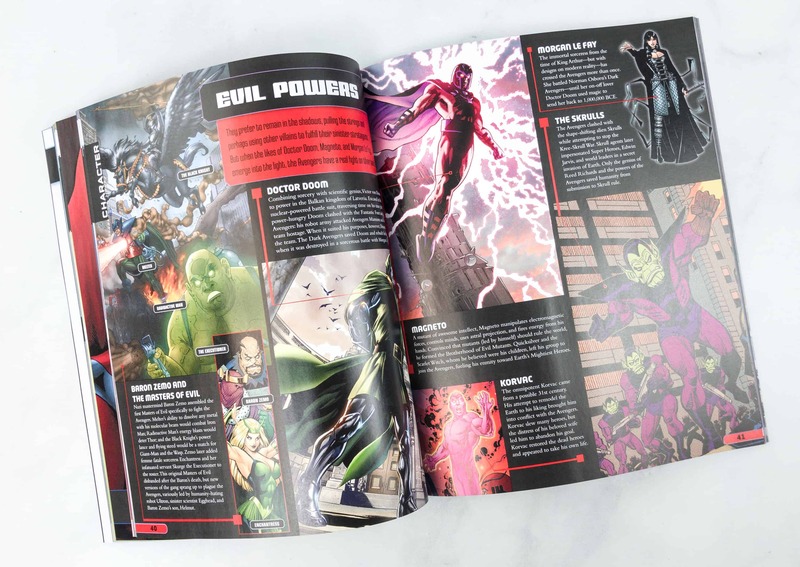 This art is fantastic as it shows the founding Avengers! 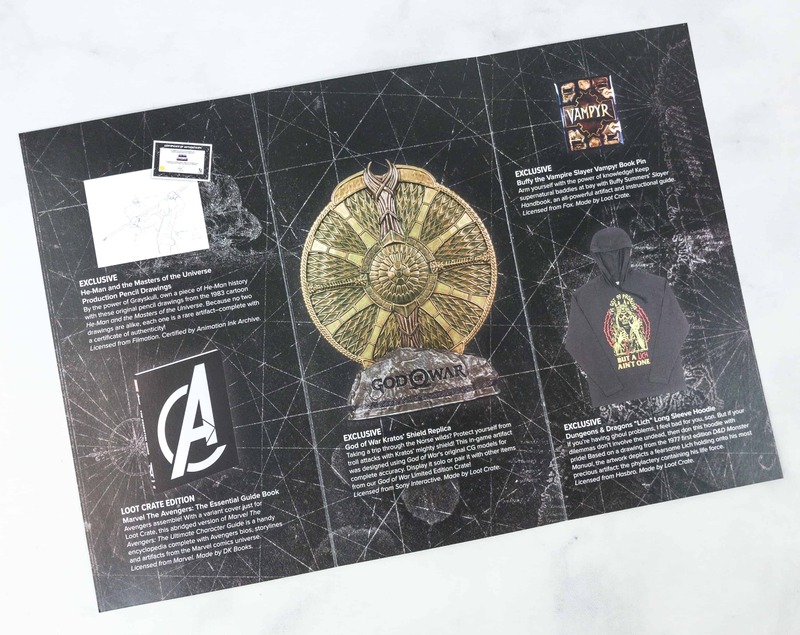 The book contains lots of information about the Avengers and each character. 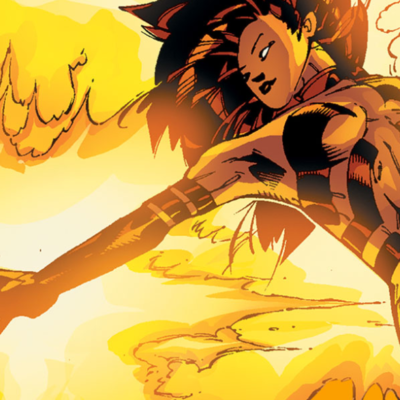 However, it focuses more on their canon in the comics. 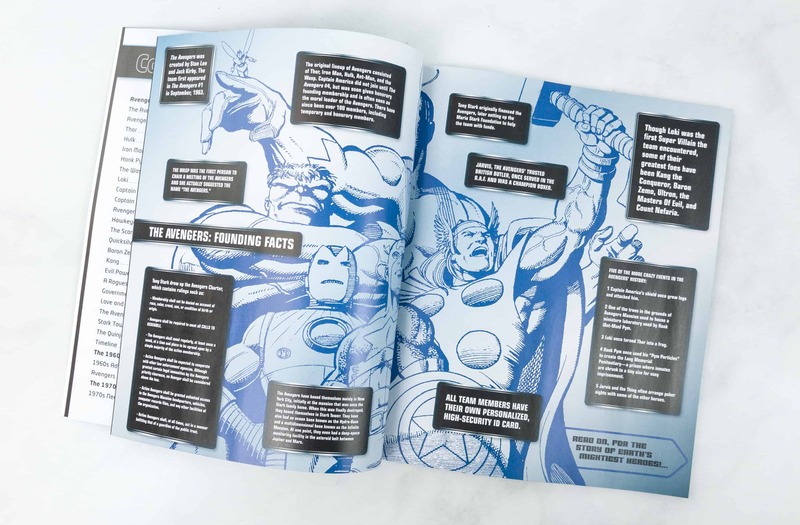 Here is a widespread page of the Founding Facts of the Avengers. It shows Iron Man, Captain America, Thor, The Incredible Hulk, Hank Pym, and Wasp. 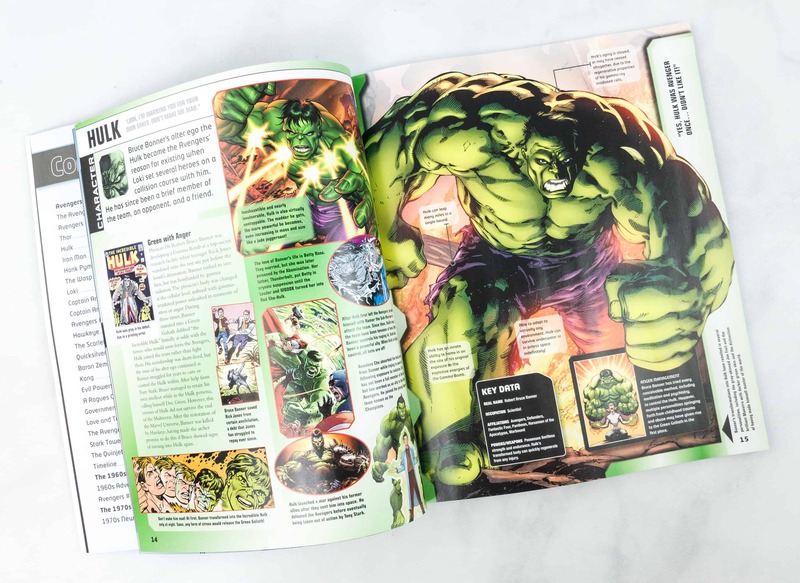 Dr. Bruce Banner got caught in a gamma bomb explosion while trying to save the life of a teenager, thus transforming him into an incredibly powerful creature called the Hulk. 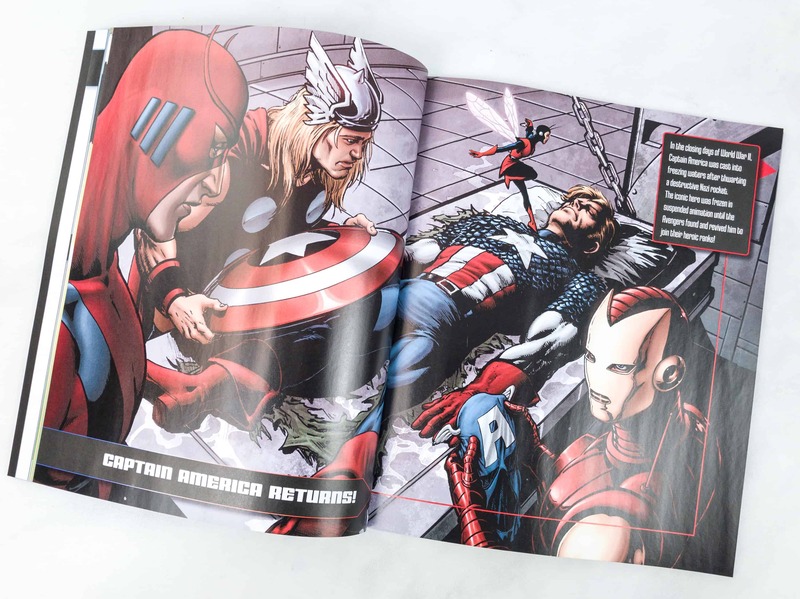 Here we can see when the Avengers found the frozen Cap and revived him to join them. As we all know, Captain America was cast into freezing water after World War II. 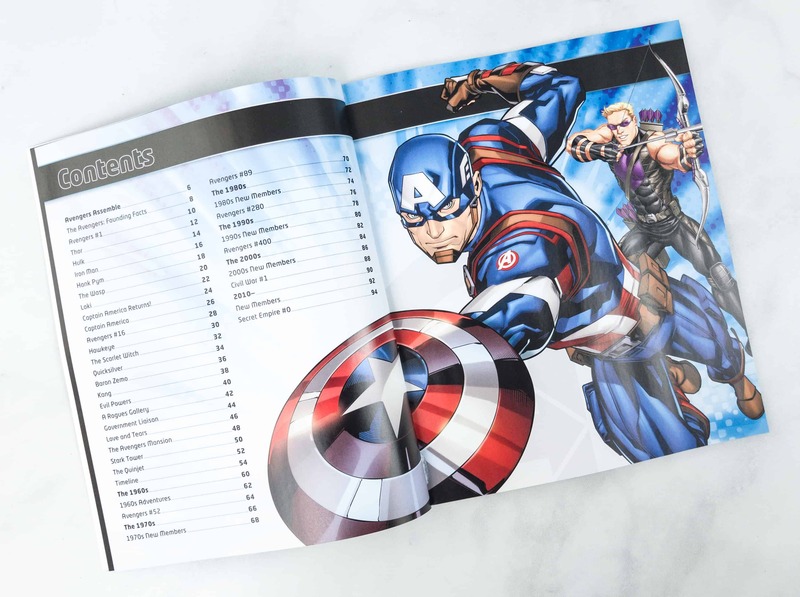 They also dedicated pages that feature the bad guys. 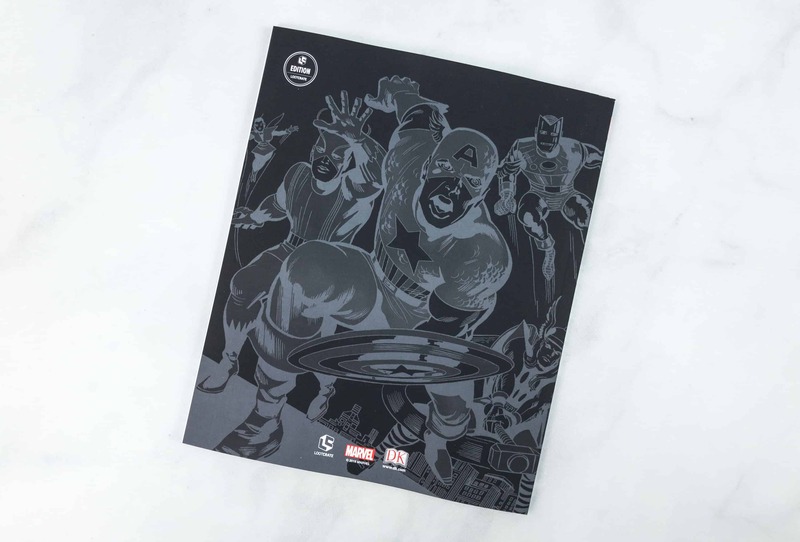 This guide can introduce film fans to the comic version! 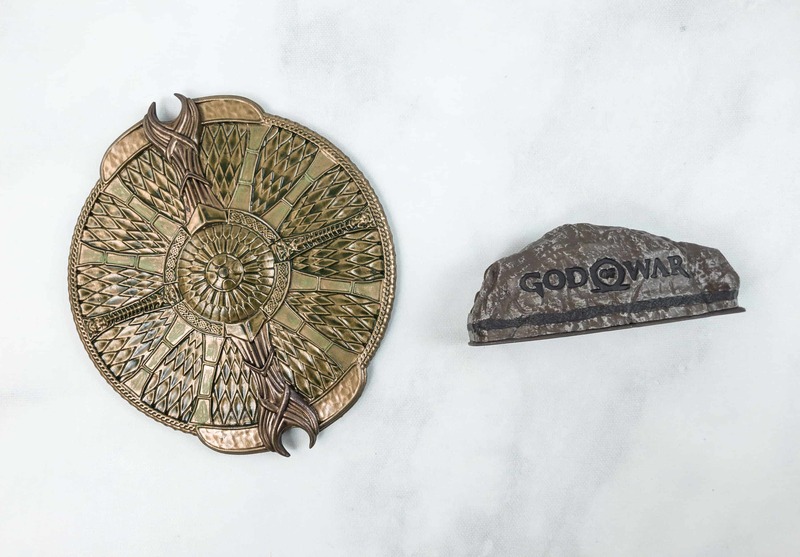 God Of War Kratos’ Shield Replica. 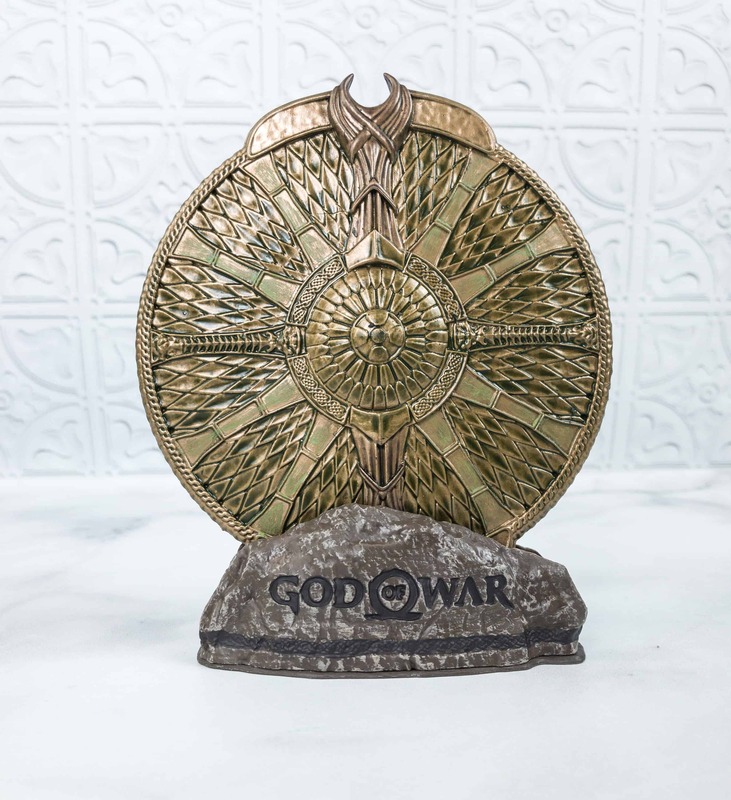 For the display item, we got the replica of Kratos’ Shield from God of War. The replica measures 5″. 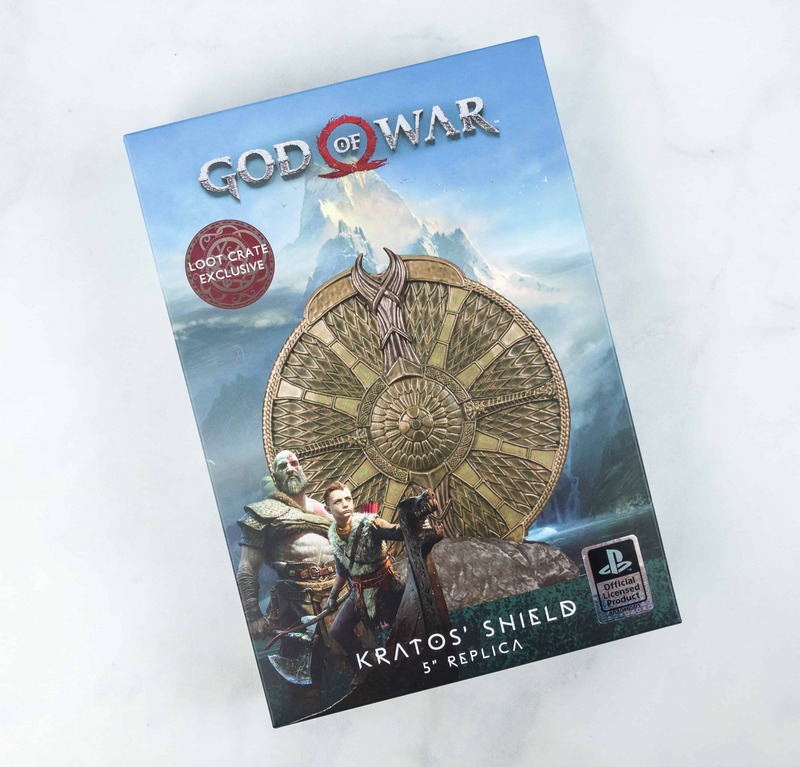 Kratos’ shield is actually an extension of himself as it springs right from his arm. 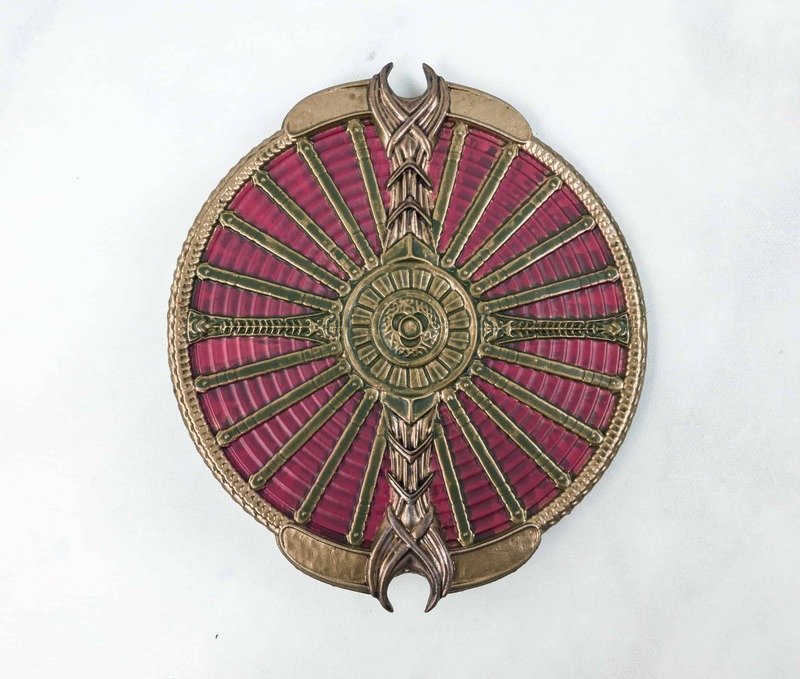 The piece comes in two easy to assemble pieces: the shield itself, and the rock mount where the shield can sit on. It is used to parry and block enemy attacks and can also be used offensively in combination with the Blades of Chaos and Kratos’s fists. 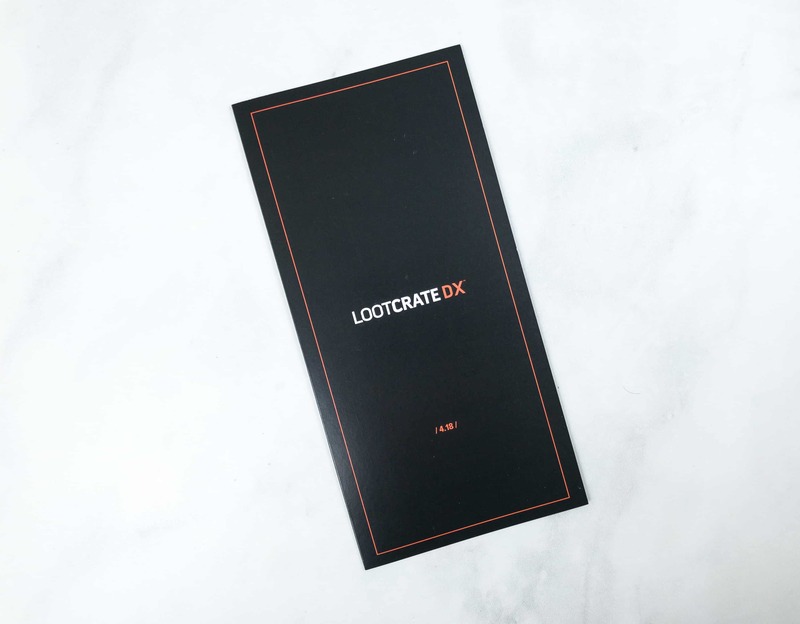 It has its own skill tree and can be upgraded. I’m amazed by the detailing on the shield. 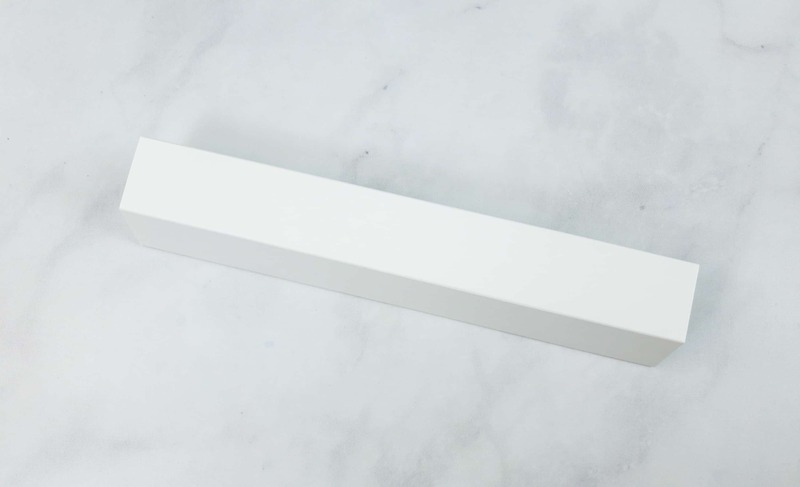 It will be a great accent on any desk! 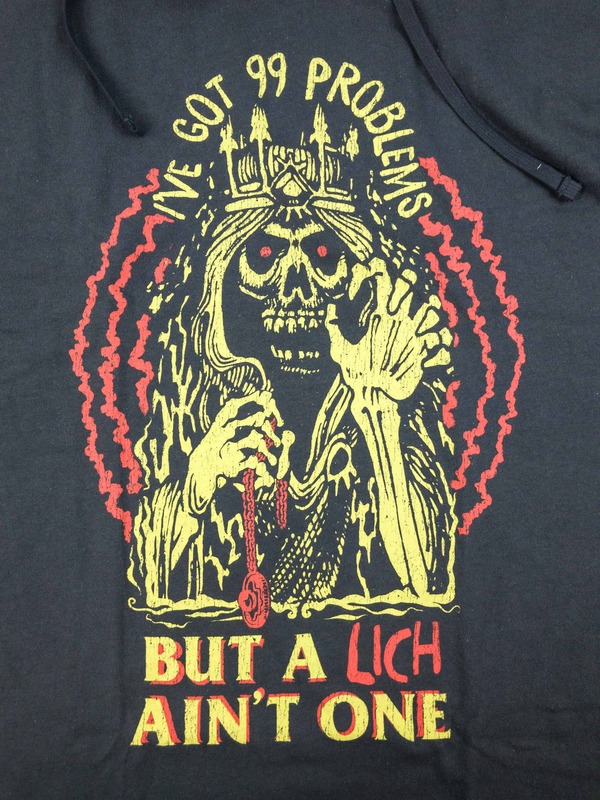 Dungeons & Dragons “Lich” Long Sleeve Hoodie. 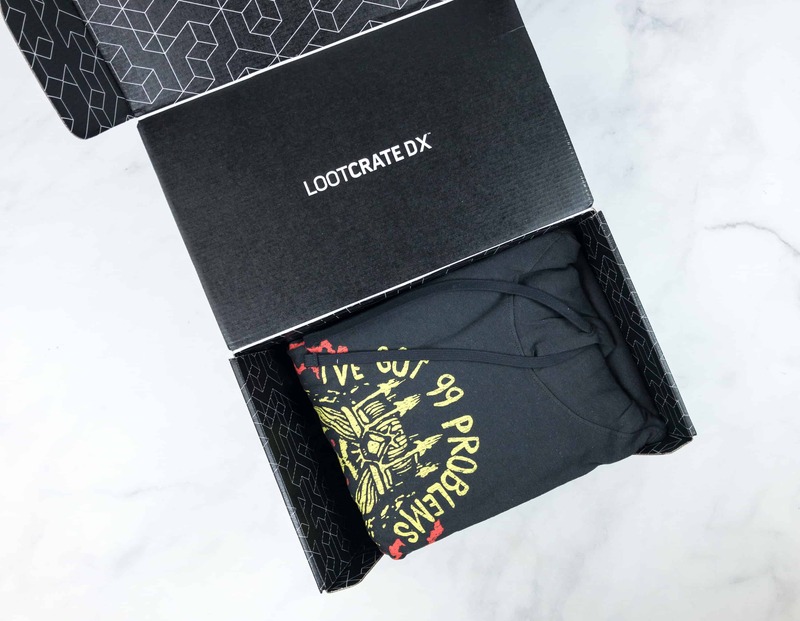 This long sleeve hoodie features Dungeons & Dragons, with a reference to the Lich! For those who are not familiar, the Lich is an undead creature and a spellcaster who seeks to defy death by magical means. 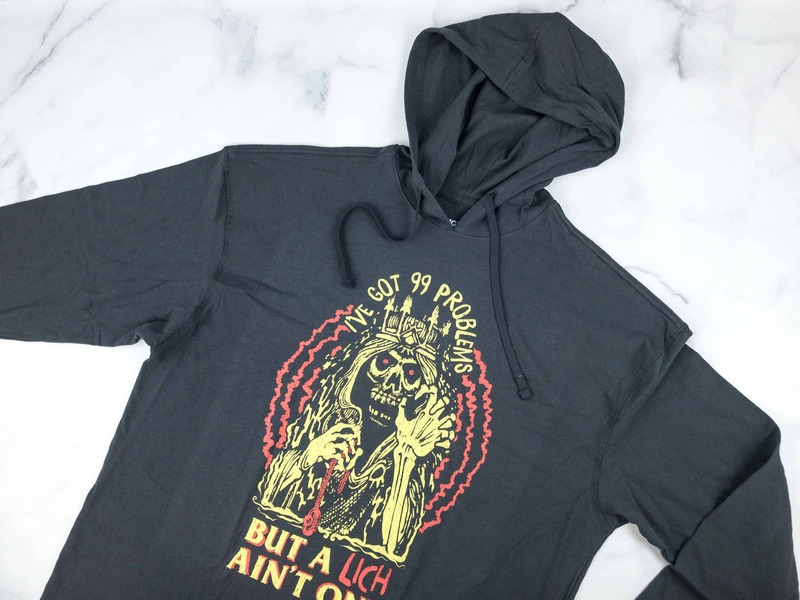 This is really a cool hoodie overall, despite the creepy Lich looking like he’s coming for you! 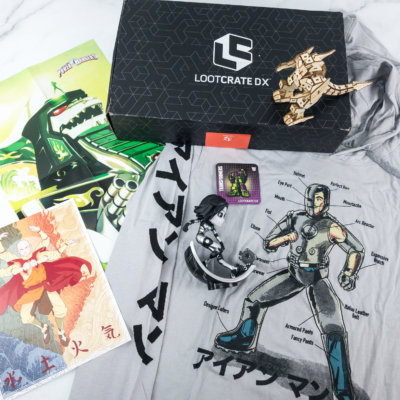 This month’s Loot Crate DX box is great! 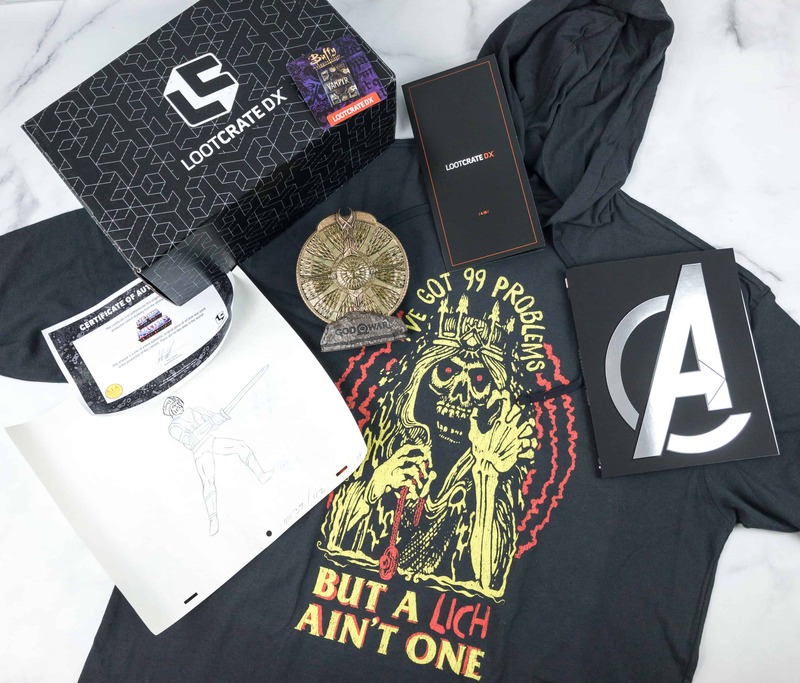 It’s a solid box that contains really interesting stuff like the Marvel guide and the hoodie. 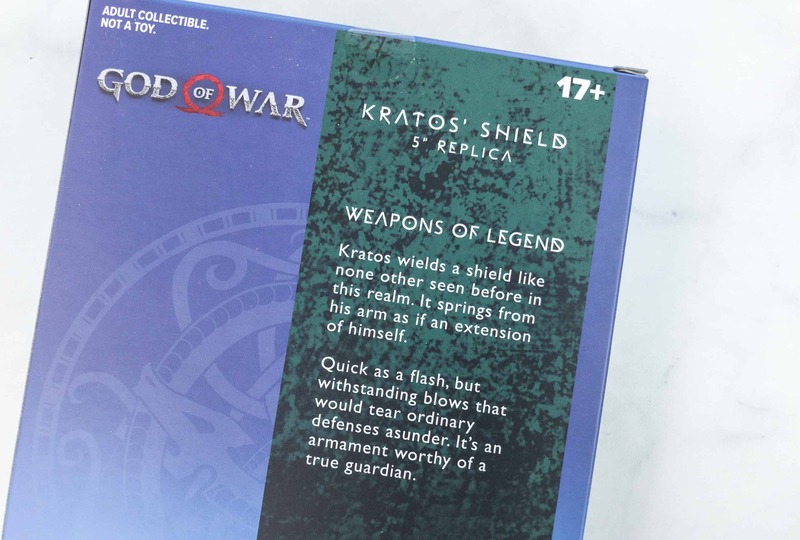 The displayable item, which is Kratos’ shield, is also an awesome item – it’s well-detailed and the paint job is just amazing. While I am not crazy about the MotU pencil drawings my husband’s enthusiasm demonstrates that it hit the target market (which I think is 40+ dudes) spot on, and it was well-balanced with a Buffy item. 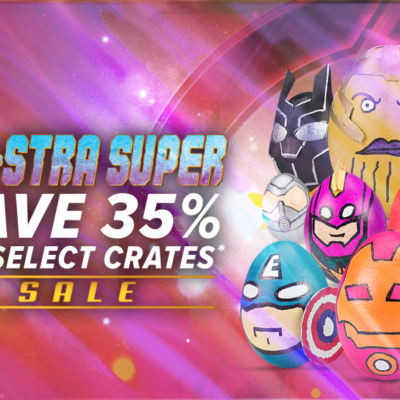 Getting high-quality, licensed, and exclusive items is really an awesome deal for geeks like us! 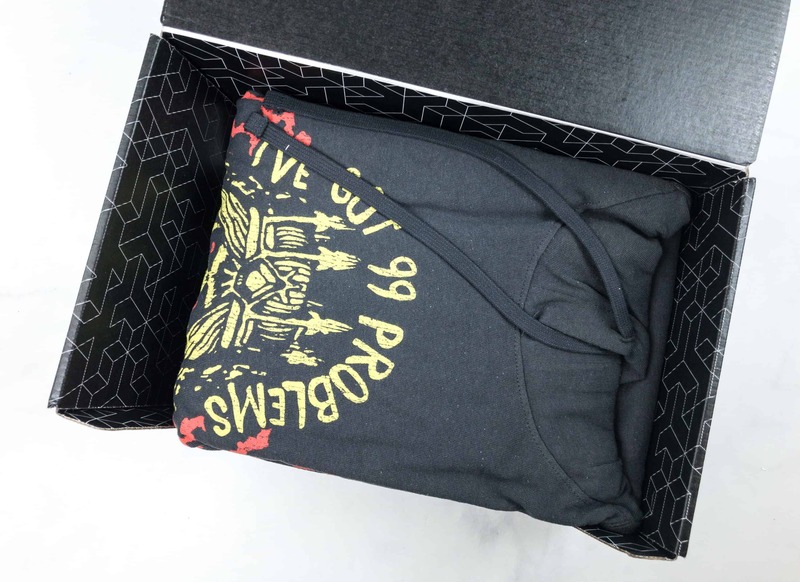 However, I’m all about the 100% Deadpool box next month. Can’t wait!